Without fail, every year, I&apos;m filled with regret when I see the "last chance for the season" notices for all our awesome farmers markets, here in Hendricks County. Why didn&apos;t I take advantage of every market, in every town, on every market day during the season? Typically, it&apos;s a long, hard winter waiting for the fresh produce and homemade goods our farmers markets offer. So, you can imagine my delight when I heard that the masterminds and amazing farmers and artisans have come together to host an indoor Winter Farmers Market. At last, they heard our pleas and have kindly organized several market dates during the winter months. And all of the Winter Farmers Markets will be inside the cozy, climate-controlled Hendricks County 4-H Fairgrounds and Conference Complex in Danville. Tuwanna Roberson, the mastermind behind this massive undertaking, saw a need for a Winter Farmers Market offering here in Hendricks County. With the help of her family, the summer market masters of Hendricks County and local farmers, crafters, artisans and community organizations, she put together quite the event. The bi-monthly event during the months of November, December and January will begin this Sunday and include 32 vendors -- just in time to make your Thanksgiving even better. The other market dates include: Nov. 26; Dec. 3 and 17; and Jan. 7 and 21. 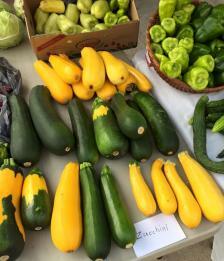 All market events will be from 2-5 p.m. at the fairgrounds, 1900 E. Main St., Danville. So what can you expect? How about fresh produce from local farmers, handmade gifts, homemade goods and all the things you love about our summer markets, such as honey, soaps, a variety of crafts and gifts, baked goods and produce. Additionally, these markets will be the perfect place to find homemade food items and handmade gifts for the coming holiday season. On Nov. 26, with holiday shopping in full swing, you&apos;ll want to put the Winter Farmers Market on your calendar. Roberson has organized a special event with more than 65 vendors. In addition to all your local favorites, you&apos;ll get a chance to shop all the direct-sales and businesses you know and love. But it gets better. From 3:30-4:15 p.m., Rejuva Wellness and Yoga of Plainfield will offer a free PIYO class during all market dates, except Nov. 26. I believe the organizers have created a Winter Farmers Market that is sure to become a yearly offering we can all look forward to. Check out their Facebook page for more information and news and make sure to mark your calendars to support the incredible artisans and hardworking farmers of Hendricks County. We have so many opportunities to enjoy the fruits of their labor during the summer, you won&apos;t want to miss this addition of a winter market.